Small retail store owners take note: A creative facade can do wonders for your business. 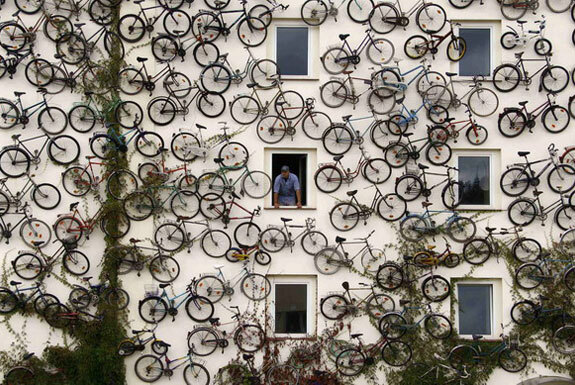 It did for the co-owners of the Fahrradhof Altlandsberg bicycle shop. Theirs has long been great little community store. 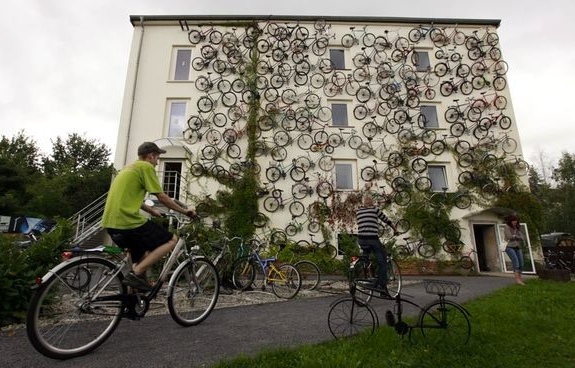 But it didn’t become famous until they attached 120 old bicycles to the exterior of the building that houses the store. Today the bicycle shop is the most prominent landmark in the quaint village of Altlandsberg. 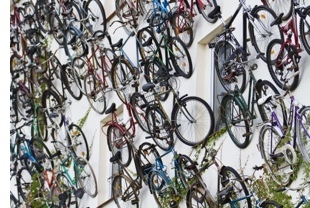 On weekends, Berliners will often cycle the 20km east to visit it and to hang out in the garden and playground out front. You can’t buy a bicycle at a Bike Fixtation. But if your bicycle has a flat tire, broken chain or busted brakes you can go to one for repairs. 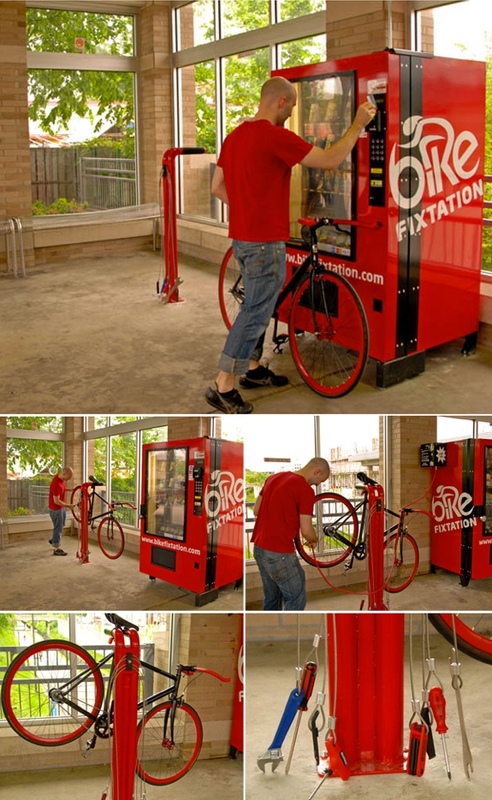 A Fixtation station consists of a self-selve kiosk for purchasing parts, a tire pump and a bike work stand with commonly used bike tools. Spot Cool Stuff would love to see Fixtations commonplace along popular bike routes. Currently there’s only one Bike Fixtation in operation; it’s located at the Uptown Transit Station in Minneapolis, Minnesota. Another Minneapolis station is currently in the works. Fixtation hopes to expand further afield in the future. If we were to purchase a bicycle at one of the stores in this review it would be at the punnily named Old Spokes Home. Though the prices aren’t rock bottom, the selection of lovingly refurbished used bikes upstairs is outstanding. 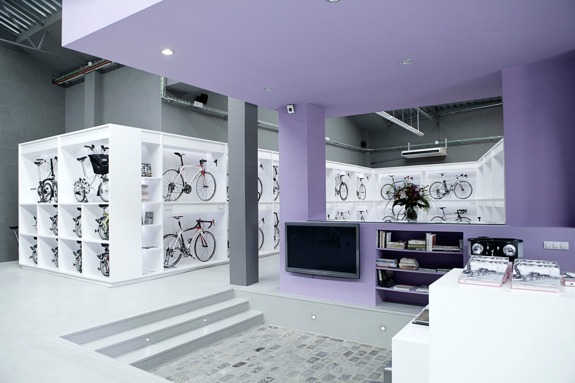 The staff is impressively knowledgeable and all bikes are sold with a lifetime guarantee. 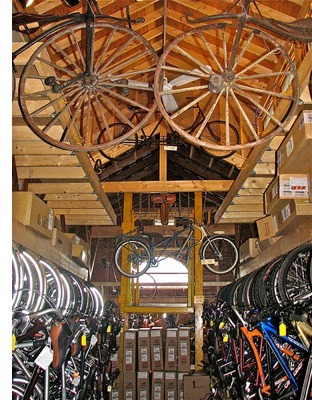 Even if you have no plans on buying a bike, the Old Spokes Home is worth a visit when in northern Vermont. In addition to the cute, old fashiony wooden store there’s a small bicycle museum on site. 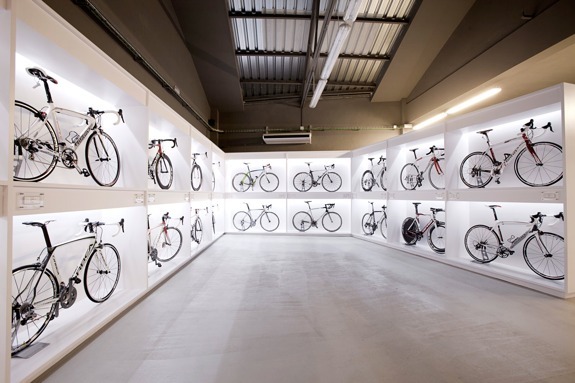 R&A Cycles claims to be the world’s largest bicycle shop. Cross town rivals Canal Street Bicycles, would counter that R&A isn’t even the largest bike store in New York City. What is clear is that R&A has a massive selection of bicycles and bike paraphernalia. It’s difficult for a store to be this big and yet feel like a friendly, family owned establishment. Yet R&A somehow pulls it off. It helps, perhaps that they’ve been at their Park Slope location in Brooklyn since 1976. 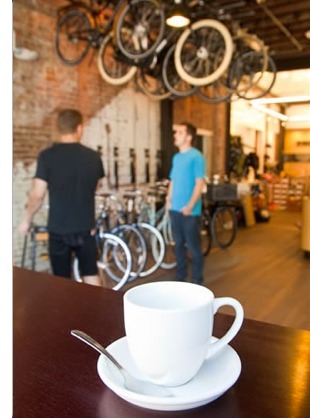 It seems to be a trend in the United States: bicycle stores doubling as coffee shops. There are several cool places where you can get a dose of caffeine along with some new bicycle brake calipers. Among the ones Spot Cool Stuff especially likes are Sedona Bike & Bean (Arizona), Angry Catfish Bicycle (Minneapolis) and The Ride Studio Cafe (outside of Boston in Lexington, MA). But we chose to feature Seattle’s Dutch Bike Company in this review. Why the Dutch Bike Company? Mostly because they sell these salted chocolate cookies that are spectacularly delicious. They also serve beer and wine. The staff is friendly. The store is quaint. And the bicycle selection, while not large, is diverse and top quality. Dutch Bike Co also rents out their classic 3-speed bicycles—especially useful for out-of-town visitors. There’s no other bicycle shop in the world where you have to give serious thought to your wardrobe before going to visit. Pave combines the design sensibility of a swanky night club and with the mentality of a SoHo loft. There aren’t velvet robes out front guarded by bouncers deciding who is good-looking enough to gain entry. But it wouldn’t look out of place if there were. What’s especially cool: There’s more to do at Pave besides buying bikes and gawking at the high design. 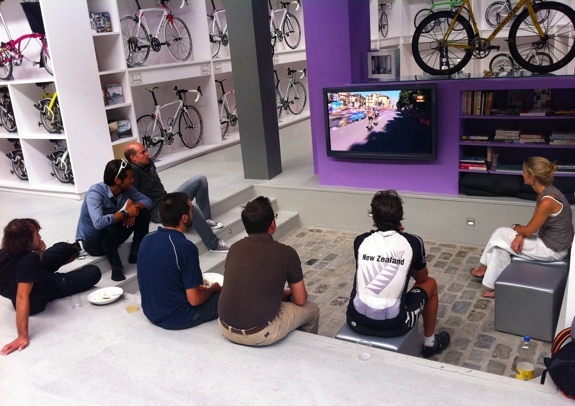 The store includes a library where you can read cycling books and magazines, a cafe where you can grab a coffee and a television viewing area where you can watch races. If you bike to Pave (as many customers seem to) you can even get cleaned up in one of the store’s showers! WOW! This is really cool stuff; thanks for sending me the link. I love to take pictures of bikes when I travel so this page is right up my alley. I will see if I can go check out the one that is near Berlin. Will need to find out which train goes out there. The Barcelona store is pretty cool as well. I pass through there later this month, so will see if I have enough time to stop in. I have obviously been renting and purchasing my bikes from the wrong sources. These are essentially specialty art galleries. So very cool. Wow, the store in Germany must be one nice sight to see! Absolutely impacting!